I learned how to make a banana fritter recipe because I like bananas so well. 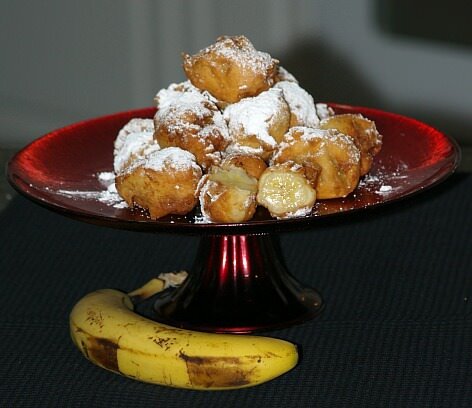 You can make these fritters by dipping whole bananas or pieces of bananas in a batter and deep frying them. You could also chop bananas in a batter and drop this batter by the spoonful into hot oil to fry. These are recipes that are enjoyed in the cuisine here in the United States and in many countries around the world. Although they are cooked in different ways, they still are banana fritters. Sift flour, sugar, baking powder and salt in a small bowl. Combine and mix in a small mixing bowl eggs, milk, oil, vanilla and grated lemon peel; beat until blended. Gradually add the dry ingredients to the egg mixture. Peel 3 large bananas, not overly ripe; slice into 1 inch chunks diagonally. Sprinkle chunks with a little lemon juice and a little nutmeg. Heat 2 inches of oil in a deep fryer to 375F degrees. Roll bananas in flour, and then dip in batter. Fry a few at a time until golden brown on both sides. Dust with sifted powdered sugar and serve warm. The first time I ate any fried bananas was in an Asian restaurant. They were whole bananas and fried in a batter; still banana fritters. These were served with ice cream for an Asian dessert. Similar recipes can also be found in many Spanish countries. It was so delicious! I knew what apple fritters tasted like and also corn fritters but I knew I had to learn how to make this banana fritter recipe because it tasted so good. Heat vegetable oil to 375F degrees. Sift flour, sugar, salt and baking powder together. Beat egg and milk together; Beat in flour mixture until smooth and add in 2 teaspoons oil. Roll whole bananas in remaining ½ cup flour; dip into batter. Deep fry in hot oil about 6 minutes; serve with ice cream. This is a different version of banana fritters. These are dropped into hot oil by the teaspoon more like corn fritters. They make a great snack. Sift flour, sugar and baking powder; add egg, 2 tablespoons oil. Add bananas and slowly stir in milk until smooth and consistency to drop from spoon. Drop into hot oil by teaspoon and cook until golden brown; dust with powder sugar. Although this is not considered banana fritters, this is also a great snack or simple dessert recipe. Heat milk in a small saucepan just until bubbles form; remove from heat and let cool slightly. Place 1 slice of toast in each of four soup plates. Slice ½ peeled banana on each piece of toast. Dust tops with powdered sugar; pour ½ cup warm milk over the top of each. Make a banana fritter recipe with cinnamon. Combine egg, milk, sugar, cinnamon and flour; mix well and beat in sour cream. Heat oil in Dutch oven about 1 inch deep; dip bananas in batter and carefully place in hot oil. Cook turning to cook all sides about 3-4 minutes until golden brown; remove from oil and drain. Sprinkle with powdered sugar or cinnamon sugar; serve warm.